If you're looking for something sweet to send your Valentine this year, look no further than The Desserted Company -- a new dessert delivery service that has launched in Denver. Basically, you'll be able to save yourself the hassle of trying to remember your sweetheart's favorite flower or having to go to the store at the last minute and instead, be getting them a box full of delicious sweets and treats delivered directly to their front door. And hopefully, they'll be generous enough to share some of their goodies with you. 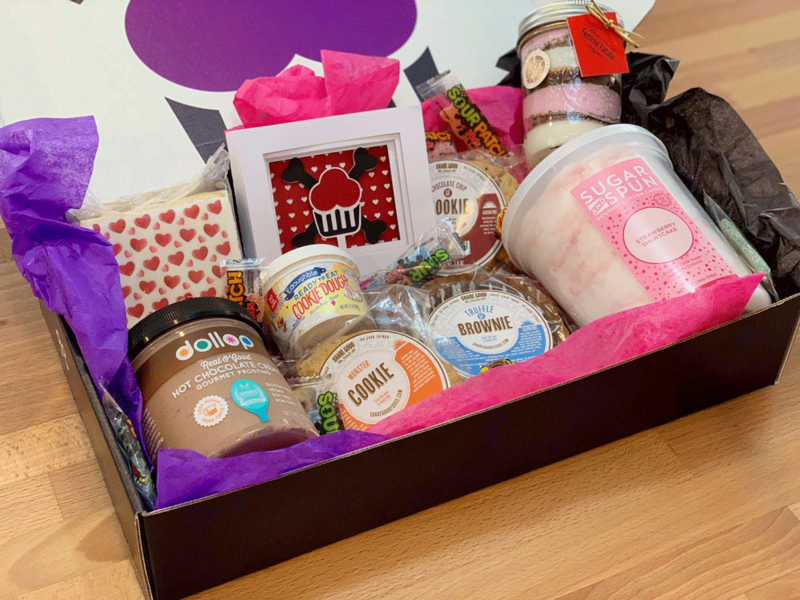 The Valentine's Day Dessert Box ($69) comes with all sorts of desserts, including seven-layer s’mores in a jar, flavored cotton candy, a crispy cake, edible cookie dough, hot chocolate-flavored frosting, two cookies, and a gluten-free brownie. It also includes a 3D shadow box card for you to write out your declaration of love, as well as fun assorted candies like Reeses, Sour Patch Kids, and Chupa Chups to top you off! Not only will you save the day this Valentine's Day, but you'll also be helping local children in need. "Each dessert box directly impacts local hungry children in Denver by donating a part of each sale to Food for Thought Denver to provide a weekend PowerSack to kids that might not otherwise have enough food outside of school," states The Desserted Company's website. Please note that if you're wanting to get your bae a box delivered on Valentine's Day, the last day to purchase is this Friday, Feb. 8, at 12 p.m. (MT). What do you think? How will you be celebrating Valentine's Day this year? Let us know in the comments below. Still looking for gifts for your sweetheart? Check out these Valentine's Day gifts that'll last a lot longer than roses!